A bug exterminator, Bill Lee (Peter Weller) discovers the supply of his bright yellow bug-killing powder is running low, because it turns out his wife Joan (Judy Davis) has been shooting it up like heroin. Bill gives the powder/drug a try too, leading to some rather bizarre possible-hallucinations involving giant bugs, alien-like creatures and who knows what else? Naked Lunch is my pick for March’s “Bad” movie, as suggested by Chip and Steve. When I asked them to nominated movies from the 1001 List that really aren’t worth my time, I was surprised by this inclusion, as it’s directed by David Cronenberg who I thought for the most part had a fairly decent reputation interesting films. As such I made a special effort to really get into Naked Lunch, assuming that Chip and/or Steve (I can’t remember which of them suggested this) had just hit this in the wrong way somehow. I’m completely unfamiliar with the William S. Burroughs novel this is partially based on (or any other Burroughs for that matter) but I have seen some of Cronenberg’s other films: Scanners, The Fly, Videodrome, Crash, A History of Violence and Easter Promises. I knew this was from his earlier, weirder period, so I had some idea what to expect, but unfortunately I ultimately end up siding with the naysayers. 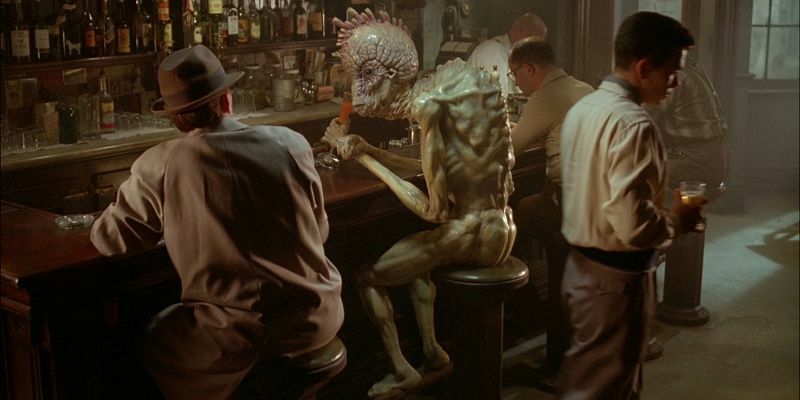 Whilst there’s a lot that I appreciated here, Naked Lunch is a thoroughly frustrating viewing experience. It’s a real shame, because the film has so much going for it. The performances are all fantastic, particularly Weller, who manages to make his character entertaining whilst behaving so laconically he might be just a few heartbeats away from being in a coma. The supporting cast are also often a lot of fun too, in particular Ian Holm (who I’m always entertained by) and Roy Scheider, playing a small yet pivotal role as a dealer of a questionable black anti-drug. No, my problem lie entirely within what would barely be referred to as a narrative. I have no idea what the freaking heck was going on for most of this film. I tend to place the story pretty highly on the list of reasons I enjoy films, and for that reason I just couldn’t get into this. There was too much happening with too little explanation, especially with regard to the very end, which ties up with some other scenes within the film but no logic of any kind. I find it very difficult to pay attention to films missing strong narratives, hence why this took a couple of viewings because I drifted off to sleep the first time, devoid of anything stable to latch onto. It really is a shame, because like I’ve said I wanted to like this one. And I nearly did. This was almost the first “Bad” film that I’d have disagreed on, but alas Steve and Chip were correct, as usual. This entry was posted in 06/10, 1001, Choose Life, Review, The List and tagged David Cronenberg, Ian Holm, Joseph Scoren, Judy Davis, Julian Sands, Michael Zelniker, Monique Mercure, Naked Lunch, Nicholas Campbell, Peter Weller, Roy Scheider, William S. Burroughs by jaycluitt. Bookmark the permalink. I admire the attempt to put this on film and I’m not sure how much better it could have been. It’s just not that good in large part because I don’t think it’s a filmable story. But hey, the attempt is impressive for what it is. Having not read the story I don’t know how unfilmable it is, but it sounds like Cronenberg made life even more difficult for himself by adding in a bunch of other elements too. It’s like he heard it was unfilmable, but just wanted to make absolutely sure.